Os grid reference: SD5770 4600. High up on the peat and moss-covered Bleasdale Fells in north Lancashire, in an enclosure of trees (at Edmarsh) stands the famous Bleasdale Circle, or in fact, a circle of 11 concrete posts marking out where a circle of timber posts used to be and, which is also referred to as a ‘henge monument’, at the centre of which was a mound with a burial inside. Located about half a mile north of the tiny village of Bleasdale, this prehistoric monument requires a good climb up onto the fells from the nearest country lane at Vicarage farm to the west, or from near Church wood, a mile or so to the south. Although there isn’t much to see here today it’s well worth checking out the place to look at the circular earthworks of bank, ditch and the squat concrete posts that tell us where the ‘ceremonial’ wood-henge once stood; some more recent wooden posts rotted away in the early part of the last century. The circle was first discovered back in 1898 and excavated within the next year and, re-excavated in the early 1930s by a more localised archaeological team; and so the site has been dated at somewhere between 2,200 to 1,500 BC – the early Bronze Age. We now know that an “early” tribal community settled, lived, and died here on the bleak and isolated fells of Bleasdale, a name which is derived from the Old Norse for ‘blesa’ meaning blaze or light spot, according to W.R.Mitchell in his book ‘Bowland And Pendle Hill’. Garstang is roughly 5 miles to the west, while the village of Chipping is 4 miles to the south-east following Chipping Brook for the last few miles. The henge site covers an area of 50 metres by 40 metres (south to north) with the much small inner circle roughly 17 metres by 20 metres (36 ft diam) at the eastern side, with funery mound 3 feet high, which was surrounded by a single-causewayed ditch (3-5 ft) floored with birch poles 10-20 cm in width, according to the authors John & Phillip Dixon in their book ‘Journeys Through Brigantia’ (The Forest of Bowland), Volume 8. Here 11 concrete pillars mark out where originally large oak posts would have formed a circle upon the mound, with an avenue of three poles on each side across the east-facing causeway, according to John & Phillip Dixon. Inside this mound (at the centre) a stone-lined chamber (cist) was discovered containing two 21 cm high decorated collared pottery urns, of the Pennine type, which would have once held the ashes of those buried here; one of the urns having a little pottery pigmy cup inside it! These urns could, therefore, be amongst the oldest collared urns found in Britain. 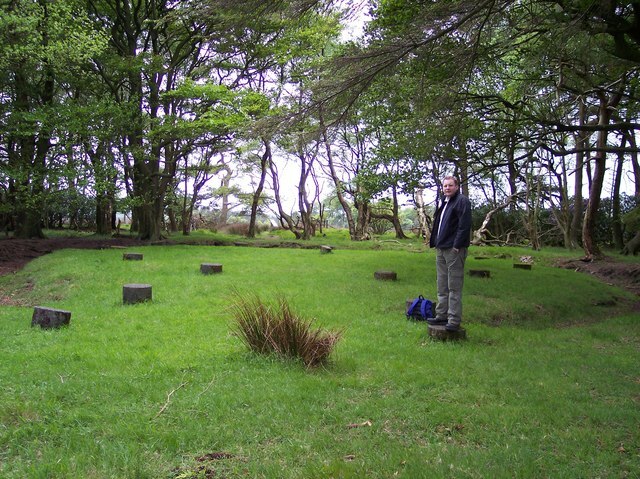 John & Phillip Dixon go on to say: “the above circular feature was surrounded by a palisade consisting of 22 large oak poles 8m. apart, between which were smaller diameter posts”. The larger, outer circle had a double entrance at the east-side some 7 metres across, with a smaller entrance at the south-side 5 metres across. Within the large outer circle there were a number of small dwelling places or huts 3-4 metres across, although these were at some point destroyed by fire, leaving only the burnt patches in the soil. These roofed-over dwelling huts with central posts would have been earthen constructions made, probably, of dung and clay. In his book The Buildings of England – North Lancashire, Nikolaus Pevsner, sums the place up quite smartly: “The site consisted of a small barrow beneath which was a grave containing two cremations in collared urns and an incense cup. The structure was surrounded by a ring of eleven posts (now marked by concrete pillars) with outliers forming an entrance on the E, and these in turn were bounded by a ditch. 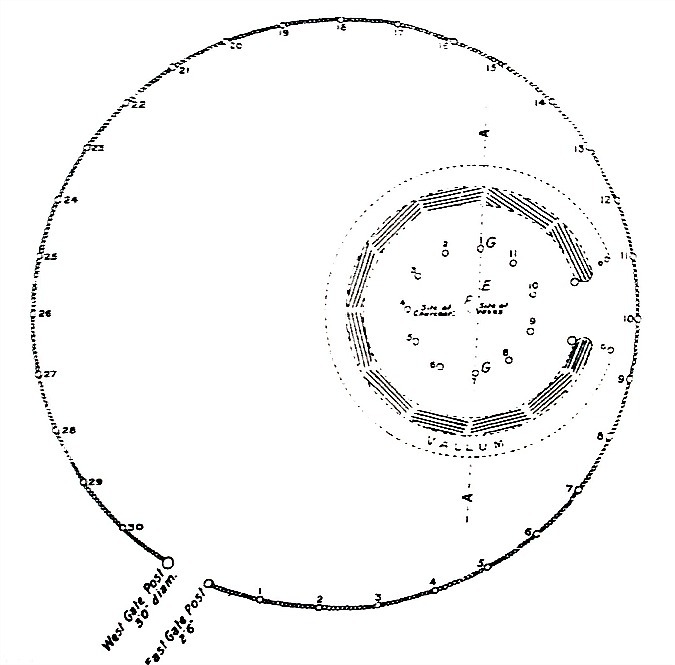 This group was surrounded by a timber palisade (not visible on the ground) 150 ft in diameter, with an entrance on the SW”. Some of the artefacts from the excavation at Bleasdale were later displayed at the Harris Museum in Preston. Please make your own mind up about the display, once you have seen it! Dixon, John & Phillip., Journeys Through Brigantia – The Forest of Bowland, Aussteiger Publications, Barnoldswick, 1992. Mitchell, W.R., Bowland And Pendle Hill, Phillimore & Co Ltd., Chichester, West Sussex, England, 2004. Pevsner, Nikolaus., The Buildings of England – North Lancashire, Penguin Books, Harmondsworth, Middlesex, England, 1979. Top Photo of Bleasdale Circle © Copyright Raymond Knapman and licensed for reuse under this Creative Commons Licence. Categories: Henge Monuments | Tags: Bleasdale Circle at Bleasdale in North Lancashire, Bleasdale Timber Henge on Bleasdale Fells in North Lancashire | Permalink.